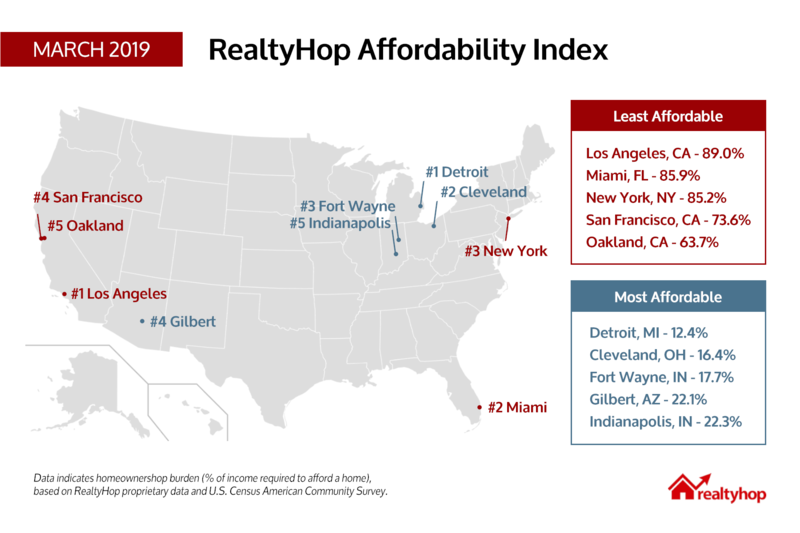 In this March installment of the RealtyHop Housing Affordability Index, we investigate the decision to purchase a home in the 100 most populous cities across America. Is homeownership affordable or even possible for the average family in each city? Every month we analyze proprietary RealtyHop data alongside comprehensive Census data to find out. 1. Los Angeles, CA was the most cost burdened city in America for homeowners this March. To purchase a home given standard mortgage and tax rates, the median household would have to spend a staggering 89% of their monthly income on mortgage costs. In reality, what this means is that homeownership is likely out of reach for the average family in LA. 2. Miami, FL was the second most cost burdened city for homeowners this month. Despite having the lowest home prices of any city in the top 5, median incomes were not high enough to make homeownership affordable for the average family. Homeownership requires 85.9% of monthly income for the median household. 3. New York City, NY was unsurprisingly not affordable for homeowners. With a median home sales price of $899,000, the median household will have to pay 85.2% of their $57,000 income annually to purchase a home. Similar to other expensive cities, homeownership is likely out of reach for the average family. 4. San Francisco, CA had the highest home sales price of any city on our list at $1,295,000. While incomes were high at $96,265 for the median household, residents will still have to pay 73.6% of annual income toward mortgage and property tax costs. 5. Rounding out the top five is another Bay Area city, Oakland, CA. While home prices were lower than San Francisco at $699,000, median household income was also much lower at $63,251. The average family can expect to pay upwards of 63.7% of annual income towards homeownership costs. 1. Detroit, MI was the most affordable city in America for homeowners this March. Extremely low home prices of $47,500 contribute to households only requiring 12.7% of annual income to own a home, given standard mortgage and property tax rates. 2. Cleveland, OH was the second most affordable homeownership market in America. Costs of ownership represented only 16.4% of median household income. 3. Fort Wayne, IN had a median home price of $139,900 and annual household income of $45,893. This led to the average household only needing 17.7% of annual income to own a home. 4. Gilbert, AZ saw a median home price this March of $350,000, with strong household incomes of $87,566 annually. This meant that local households would only have to pay 22.1% of income toward homeownership costs. 5. Indianapolis, IN rounds out the top 5 most affordable markets, with residents only paying 22.3% of annual income toward housing costs. Affordable home prices contributed to this rank. As mentioned earlier, in markets with very high home prices relative to income, average households will continue to rent rather than buy. While purchasing a home is already difficult in many places across America, those at the top of our list experience a climate that makes it almost impossible for the average family to own a home. California was by far the most burdened state for homeowners this March, with 9 out of the top 15 cities on our list located in the state. Florida saw two cities make our top 10, Miami and Hialeah. Despite lower home prices relative to other expensive cities, median household incomes were not enough to offset this. The RealtyHop Housing Affordability Index analyzes both proprietary and ACS Census data to provide an index of housing affordability and homeownership burden across the 100 most populous cities in the country. Median home prices are calculated using over 300,000 listings in the RealtyHop database over the month prior to publication. 4) Mortgage expenses, assuming a 30 year mortgage, 4.5% interest rate, and 20% down payment.